No other manufacturer has yet achieved and matched MMM's exciting standards in precision cleaning. MMM is not only more efficient and effective than any other ultrasonic cleaning technology, it is UNIQUE. Seeing is believing! 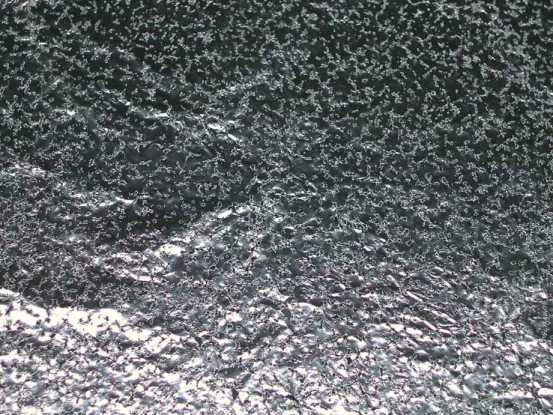 Try the aluminum foil test for yourself. Place the foil sample into our ultrasonic bath and hold the foil for approx. 5 - 10 seconds and you'll discover why there's simply no comparison with any conventional ultrasonic cleaning machine! Superior and deep penetration, independent of water levels. Reliability with extra power spread throughout the bath. Even distribution of ultrasonic energy throughout the liquid gives uniform and thorough cleaning of the surface without the risk of damage to fine parts and sensitive instruments. Extremely efficient electronics and transducer coupling to ultrasonic bath (overall approx. 95% efficiency) reduces or eliminates the need for additional heating. Spatial distribution of ultrasonic activity inside of a cleaning liquid is homogenous (no dead zones, no standing waves, fast and large frequency sweeping, broadband spectrum, complex modulation). Cleaning solvents, detergents and additives can be significantly reduced, or even eliminated because of the very high cleaning activity of the acoustic broadband spectrum. Cleaning time can be several times shorter comparing to traditional ultrasonic cleaning technology. Fast liquid conditioning and degassing because of very large regulating zone between maximal and average ultrasonic power and because of the ability to switch instantaneously between acoustic spectrums. Smooth Ultrasonic, PWM-power regulation from 1% to 100%. Ultrasonic energy can be easily adjusted in order to clean very fine and sensitive parts without damaging them. Fast and automatic ultrasonic-power and high-activity recovery after liquid mixing and after introducing ultrasonic load (after introducing parts to be cleaned). Cavitation level can be smoothly controlled from very low to very high (by changing signal-processing parameters of MMM generator). Ultrasonic erosion and mechanical damages to cleaning baths and vessels, as well as on the parts under cleaning is significantly reduced (compared to traditional technology) because of uniform distribution of ultrasonic activity. 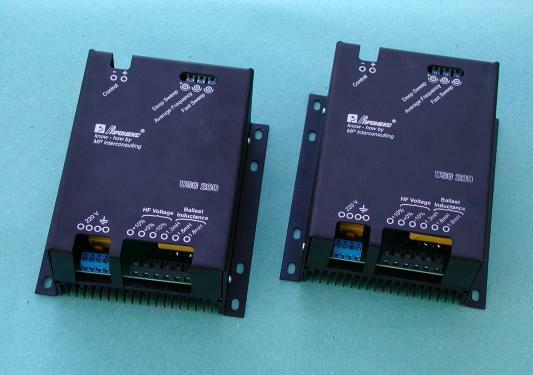 MMM Ultrasonic Power Supplies can drive any traditional piezoelectric transducer(s), using less energy and producing superior cleaning effects, compared to traditional ultrasonic power supplies - both single frequency and frequency sweeping types. Several levels of overload protection are implemented. Until now, conventional ultrasonic cleaning baths have been very power hungry and power inefficient, only about 5-25%. Larger industrial units could become power hungry monsters, making the unit not only inefficient but also ineffective. Often as a last resort, heaters are used to "assist" cleaning. 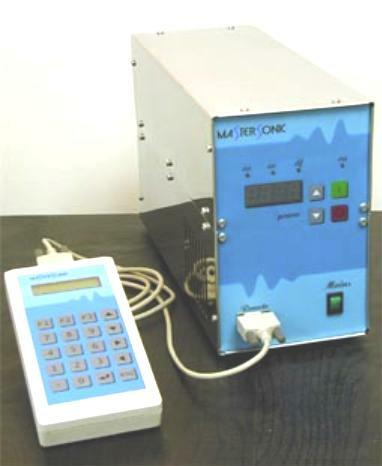 There have been conventional "sweep frequency" ultrasonic cleaners but still based on "fixed frequency" and narrow frequency interval sweeping, with a slightly faster response time. "Fixed frequency" is more suitable to work in pre-determined conditions e.g. in ultrasonic welding of plastic parts. Conventional fixed / single frequency operation results in "standing waves" being set up in the cleaning bath. A direct consequence of these standing waves is that cleaning is patchy across the surface being cleaned. Thus, some areas are excessively cleaned while other left unaffected. It also makes the effectiveness of conventional ultrasonic cleaner very variable and subjective to fluid level, fluid temperature and load conditions. Using our state-of-the-art MMM technology, these "standing waves" do not exist and the efficiency goes up tremendously!